Wednesday December 9, President Obama hosted the annual White House Chanukah Party, an event for which tickets are highly sought after. It is one of the few non-partisan event left in Washington DC. Upon arrival, guests were serenaded by the Maccabeats, Yeshiva University's A Cappella group, as well as Jewish superstar, Lipa Schmeltzer. Israeli President Reuven Rivlin, a guest of honor at this year's Chanukah party, led the candle lighting ceremony. He reminded partygoers of the Maccabees' struggle "for liberty, for freedom of religion, for our traditions, for their ability to celebrate their own identity." Whilst addressing his guests, President Obama expressed the inspirational messages of the Chanukah story: the weak prevailing against the strong, freedom over tyranny and light over darkness. The prestigious guest list included U.S. Ambassador Dan Shapiro, Republican Rep. Lee Zeldin, Rabbi Abraham Shemtov, Rabbi Levi Shemtov, President of Israel Reuven Rivlin, Israeli Ambassador Ron Dermer, Abe Foxman, Malcolm Hoenlein, John Ruskay, former Congressman Henry Waxman, Sol Werdiger, Joseph Stamm, Ezra Friedlander, Rabbi David Zwiebel, Abba Cohen, White House Chief of Staff Denis McDonough as well as Alan and Judy Gross. It was at last year's Chanukah party that President Obama announced Alan Gross' release by the Cuban government. 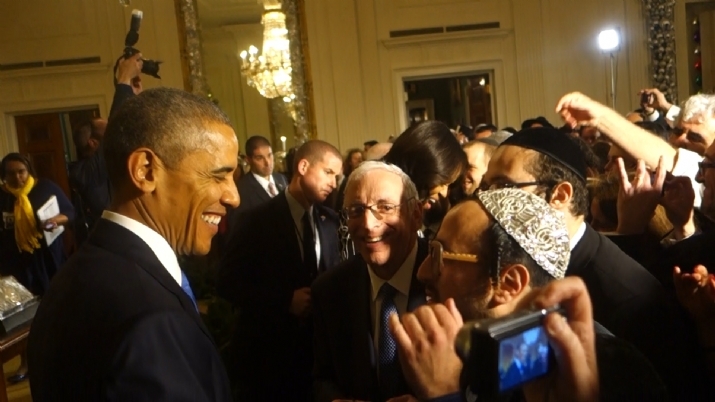 "It was an honor to be able to attend the White House Chanukah party this year," said Ezra Friedlander CEO, The Friedlander Group, "what a privilege it is to not only live in a country that allows people the liberty of openly practicing their religion but celebrates their traditions alongside them. Having a Chanukah reception at the White House is a reminder to American Jewry that embracing our religion is in sync with being a good American."